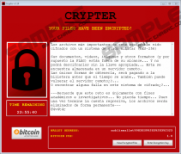 Noblis Ransomware might be a new threat designed for money extortion. Also, our researchers say it could be targeted at users who speak the Spanish language only, although we cannot be one hundred percent sure. As you see, it appears to be the malware is still being developed. It means some things may yet change; for example, the hackers could add text written in English too or replace the Spanish message with it. The one thing we are sure of is the malicious program's capability of encrypting files located on the infected computer. Thus, the most critical question is how such an infection might be delivered? It is also one of the issues we will discuss in this article, so if you are keen to learn more about Noblis Ransomware, we encourage you to take a closer look at the rest of this text. Users who would like to know how to erase such a threat should check out the manual instructions we will add at the end of this text as well. First of all, let us discuss one of the most critical questions that may help some of you avoid Noblis Ransomware. Our researchers say the malware could be distributed via various channels, for example, Spam emails, malicious file-sharing web pages, etc. However, from our experience, we can say the most popular method is sending potential victims malicious email attachments. Moreover, to convince the user to open such file the hackers sometimes come up with a message explaining why it is so important to open it right away. Plus, to make the malware’s installer look less suspicious, its creators might make it look like a text document, an image, and so on. For this reason, we always recommend being extra cautious even with any email attachment that comes from an unknown sender. For example, to protect the system from being infected, you could scan the file in question with a trustworthy antimalware tool. Unfortunately, if the malicious program's installer is launched, it should start encrypting your data right away. That is because Noblis Ransomware does not need to create any additional data; it works directly from the directory where it was launched. Our researchers say it should avoid encrypting files in folders belonging to the computer’s operating system or other important software, but as for user’s documents, photographs, and other private data; all of it could become encrypted. It should not be difficult to separate affected files they should be marked with a specific second extension, for example, sea.jpg.noblis, vacation_trip.avi.noblis, and so on. What’s more, soon after enciphering targeted files, the malware is supposed to display a window with specific instructions or to be more precise, a ransom note. The threat’s window does provide a few short phrases in the English language, but the ransom note is written only in Spanish. After translating the text, we saw a message saying the victim can encrypt his files if he pays a ransom. 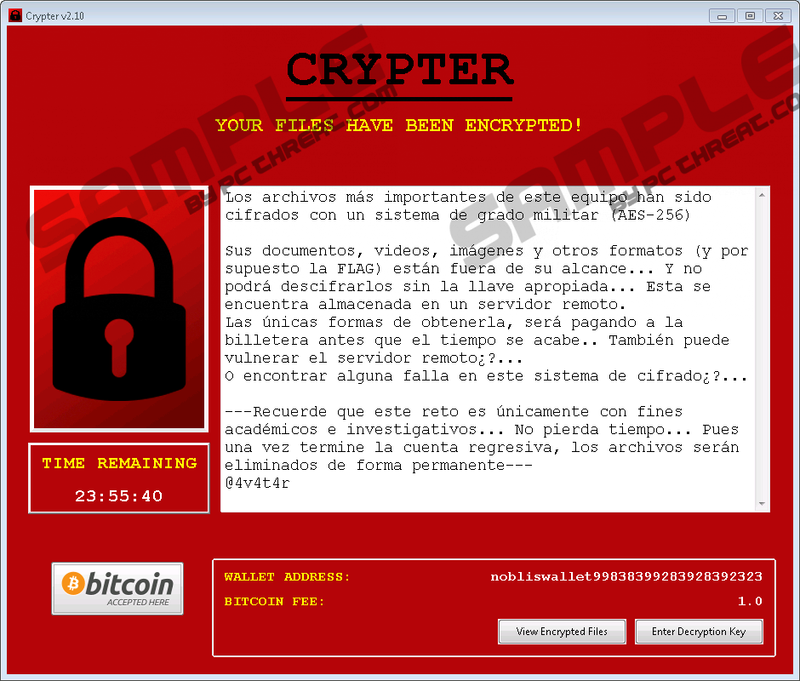 It appears to be in exchange Noblis Ransomware’s developers would send a decryption key which then could be inserted into the malicious program’s window, and the user’s enciphered files would become decrypted. Needless to say, there is also a chance the malware’s creators will not bother to send the promised decryption key, it will appear to be they no longer have it, and so on. Because of these risks, we recommend not to gamble with your savings and delete the infection if you ever encounter it. Slightly below this paragraph, we will place manual deletion instructions to explain how to remove Noblis Ransomware from the system on your own. Before using the instructions, users should know we cannot guarantee that completing the provided steps will erase the malicious program completely since the hackers could still change something before they finish the threat. Therefore, if you ever encounter this malware and decide to eliminate it, you should know it might be safer to install a reliable antimalware tool, perform a full system scan, and get rid of the infection by pressing the provided removal button. Find a malicious file you could have opened before Noblis Ransomware appeared. Quick & tested solution for Noblis Ransomware removal.